We would like to commend yourself and your team on your professionalism, quality of workmanship and the ‘good humour’ you displayed when you recently rewired our home whilst we were still living in it. It didn’t help that I had started a new job on the first day you commenced the work and my husband works from home, but you were fantastic! You arrived before 8 o’clock on the first morning with a team of three, so that you would cause minimum disruption, and, throughout the course of the ‘job’, you arrived before 8 o’clock every morning and never left the job. You always made sure that we were never without electricity in the evenings even though the job took four days – had you not brought such a willing, cheery and healthy team it would have taken longer! Every night when I got back our home was clean and tidy, thanks. You were always ‘at the end of the ‘phone’ and if we had any questions you always answered them and we always felt very comfortable. We would recommend you to anyone to whom you give a quote and please feel free to give our contact details to anyone who needs to go through the experience of having their home rewired whilst they’re still living in it -it can be done, without heartache, and you guys are a testament to that. PS Thanks for recommending the central heating engineer he’s been as brilliant as you! would like to take this opportunity to thank you for the electrical work that you carried out for me recently and over the last 20 years! As usual the work was of the highest standard, carried out at the agreed price and undertaken at the arranged time. 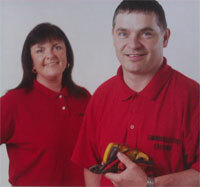 Over time you have proved yourself trustworthy, honest and a skilled tradesman. the people, including family and friends that I have referred you to, always comment on what a good job you do, at a fair price and how you always tidy up after yourself. Once again thank you and keep up the good work. I have known Paul Edmundosn for 15 years and during this time he has done all the electrical work that I have required, including a burglar alarm installation. During this time I have found him to be very reliable, and the work that he ahs done is of a very high standard, also his charges for doing the work have been very reasonable. I have recommended him to several friends and neighbours, and they have all been very satisfied with the work that he has done for them. I also believe that some of them have recommended him to their friends and relations. I have no problem in recommending Paul to anyone who requires any electrical work and I am sure that it will be very satisfactory. It is a pleasure to write to you regarding Paul Edmundson, who we have known for many years. he has carried out many jobs for us and has always shown himself to be honest, reliable and hardworking. the quality of his work is absolutely first class and we have had no problems whatsoever. We commend him for any type of electrical work. We have known Paul for over 10 years and during that time he has carried out various electrical installations on our own premises and for other people that we know. Paul has always shown himself to be prompt and reliable, trustworthy and courteous, knowledgeable in his field, professional and hardworking. I would have no hesitation to recommend him either for domestic or commercial electrical work. Designed by Web Design by Magic.